Custom Printing - Coda, Inc. If you want to leave your clients with a long lasting impression of your company’s branded information printed directly onto a CD, DVD or Blu-ray disc then look no further. Coda offers a variety of custom print finishes accommodating both your needs and budget. Whether your priority is print quality, durability or cost, we’ve got you covered! As part of our ongoing pledge to provide you with the highest quality printed discs possible, we offer complete “direct-to-disc” print technologies that include Silkscreen printing, Offset printing, Digital (Flatbed) and Thermal printing solutions. Coda also offers digital adhesive labeling as part of our “value series” digital print solutions. Each print method plays a different role in the industry but we here at Coda keep our finger on the pulse when it comes to manufacturing state of the art printed discs period! CODA offers custom, in-house high quality silkscreen printing up to 5 colors. Our silkscreen prints are Water Resistant, Smudge Proof, and will not Crack, Erase or Peel!Silkscreen printing uses a mesh based system where ink is forced through a wire mesh or “screen” and is directly transferred onto the disc surface. The end result is stunning vivid colors printed on to your CDs or DVDs. Silkscreen printing is ideal for graphics that consists of solid colors and is based on the original pantone color structure. Silkscreen printing is your go to choice when you need consistent high quality results and a rapid turnaround. Offset printing is part of CODA's "direct-to-disc" print solutions offered and continues to be the best choice when large volume print runs are required. Offset printing technology uses a 4-color process that utilizes standard inks often referred to as CMYK (Cyan, Magenta, Yellow, and Black) for printing directly onto CDs, DVDs and Blu-ray discs. The ink based images are transferred to the print surface via rubber rollers to create a dynamic high-resolution output! Offset printing is ideal for images consisting of heavy gradients, flesh tones and other complex color compositions. Offset printing is the highest quality print option available for volume runs and is recommended for retail ready or store quality printed discs. Digital flatbed printing is yet another arsenal CODA deploys as part of its “direct-to-disc” print solutions offering. This digital print method uses a flatbed style surface and digital print head making it an economical and efficient solution for disc printing. Our flatbed digital printer provides smooth, crisp image clarity with consistent color prints on each and every disc. At an impressive 4800-dpi resolution*, our digital prints deliver high-quality, professionally finished CDs and DVDs that will simply look amazing. Our digital printer also prints at an incredible rate, printing approximately 400 full color edge-to-edge discs in an hour. With this type of throughput, we are able to turn projects around quickly and accurately. The colors produced are brilliant which will make your discs stand out from the rest. CODA is home to several Rimage Everest thermal printers that offer nothing but high quality, photorealistic images printed directly on to your CDs, DVDs and Blu-ray discs. Our Everest printers produce the highest quality prints the industry has to offer. With features like 600 dpi resolution, full color or black & white permanent prints make it a premium choice when it comes to disc printing. Our automated Rimage printers use a heat transfer process that produces perfect image quality at high resolutions. Full color graphics, images and text will look very attractive and much more desirable on each disc. The prints are permanent and will never erase, smudge or fade. Everest printing is also a very flexible and affordable option for printing short runs or jobs fewer than 500 discs. Still looking for professionally printed discs but tight on budget? No problem, we understand! That’s why CODA you find our “value-series” digital printed adhesive labels. Digital labels allow you to quickly personalize and identify your discs. Never leave your clients’ guessing who your media belongs to! No need to spend high costs on inks and cartridges to give your discs the astonishing look it deserves. Now you can give your clients professional printed discs without breaking the bank. • Printed on photo quality, matte white labels to produce vibrant color resolution. • Precise label alignment ensures labels are properly adhered to disc. • Permanent, non-peel adhesive for safe labeling. When quick turnaround is necessary and the content is dynamic digital printing is a great solution for small volume print jobs. CODA is capable of printing directly from customer provided artwork. Our Digital Printing System (DPS) is ideal for short run production for jewel case inserts and tray cards, CD labels, and can handle a variety of paper stock sizes. This system uses a toner-based print process that produces excellent quality prints. So which print solution is right for you? Well that all depends on your artwork, quantity required and deadline. 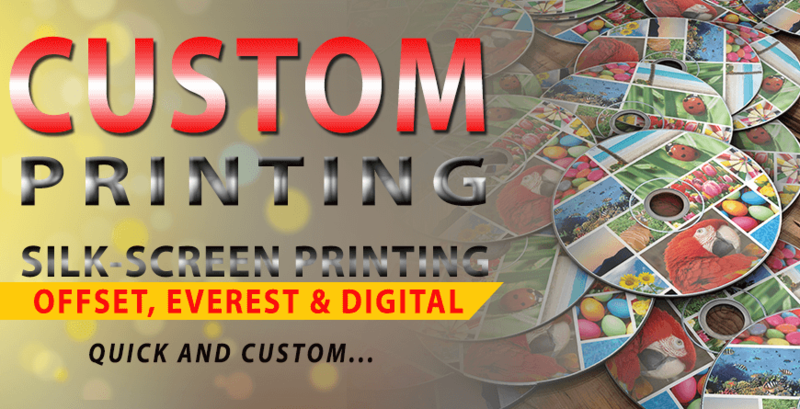 In a nutshell if your artwork consist of strong gradients and requires mass production we recommend offset printing. If your graphics consist of solid colors and requires mass production then silkscreen may work best in this scenario. For smaller runs Everest, Digital or Adhesive Labels may fit the bill. Contact one of CODA, Inc. representatives and submit your artwork to get a FREE evaluation of which print method will work best for you. You can also contact us for samples of each different print type we offer.